Obesity has been called an epidemic in the United States. Some 15 million older adults — people over the age of 51 — are obese. This represents nearly one in four older adults. While obesity itself is not a chronic condition, it is a risk factor for many chronic conditions, including four of the ten leading causes of death in the U.S. — coronary heart disease, type II diabetes, stroke and several forms of cancer.1 Obesity not only affects the health of older adults, it also affects their day-to-day lives. Older people who are obese report more activity limitations and more feelings of sadness and hopelessness than those who are not obese. Differences between the obese and non- obese populations are particularly striking for people age 51 to 69. Body Mass Index (BMI) expresses the relationship of weight-to-height and is used to screen and monitor the risk of obesity. An overweight adult is one whose BMI is greater than or equal to 25 and less than 30. For example, an adult who is 5’6″ and weighs between 155 and 185 pounds is overweight and one who weighs more than 185 pounds is obese. This Profile examines adults age 51 and older who are obese. The group of older adults who are either overweight or of healthy weight are referred to as not obese. Since 1991, rates of obesity have increased dramati-cally. Substantial increases among adults of all ages suggest that obesity among older Americans is likely to become a greater problem in the future. Among the obese population age 51 and older, a disproportionate share — three-quarters — are age 51 to 69, yet this age group comprises only two-thirds of the general pop-ulation age 51 and older. 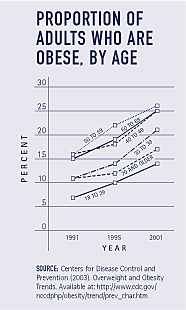 While obesity rates have increased for everyone, some groups have much higher rates. 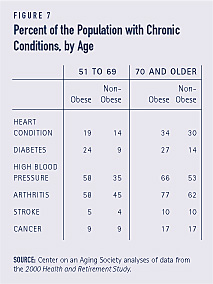 In particular, obesity rates are greater among adults age 51 to 69 than among people 70 and older (see Figure 1). Rates are also higher for older adults with lower incomes and those with less education — 27 percent for those who did not graduate from high school, compared to 22 percent for those with a high school degree or more. Non-Hispanic whites age 51 and older have the lowest rates of obesity compared to adults of the same age of other racial and ethnic backgrounds. 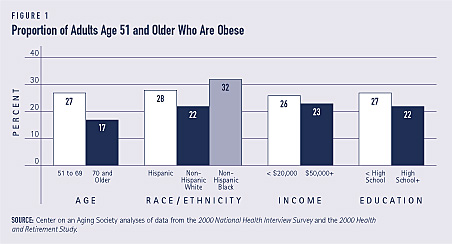 Older men and women have similar rates of obesity. An individual is considered to have a disability if he or she has difficulty with tasks such as eating, bathing, dressing — tasks known as activities of daily living (ADLs). Individuals who have difficulty with several ADLs are often referred to as “severely disabled.” Obese older adults are more likely to be severely disabled than those who are not obese. 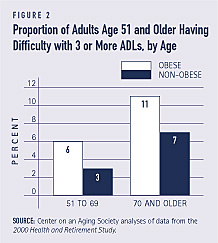 This is particularly true for obese 51 to 69 year-olds — they are twice as likely to have difficulty with multiple ADLs than those in the same age group who are not obese (see Figure 2). People who have difficulty with ADLs and require assistance of another person rely primarily on family and friends. This is true for both obese and non-obese older Americans. However, those who are obese are somewhat more likely to receive help from spouses, children or grandchildren — 77 percent compared to 72 percent for non-obese adults. Older obese adults are somewhat less likely to receive help from a professional caregiver — 6 percent — compared to 8 percent for non-obese adults of the same age. 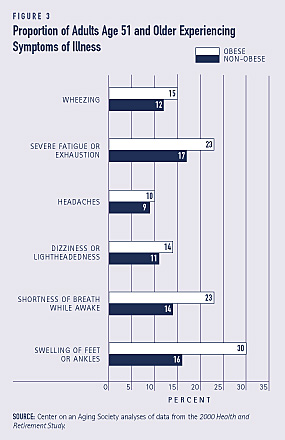 Older adults who are obese are more likely to suffer from persistent and chronic symptoms of illness, such as fatigue or wheezing, than adults age 51 and older who are not obese (see Figure 3). It is notable that obese adults age 51 to 69 experience symptoms at rates that are more similar to adults 70 and older than to those in their age group who are not obese. For example, 22 percent of obese adults age 51 to 69 say they frequently feel severely fatigued or exhausted, compared to 14 percent of those of the same age who are not obese and 21 percent of all adults age 70 and older. 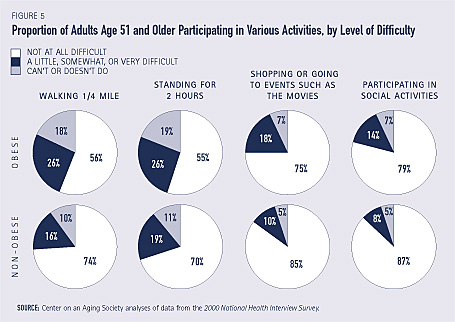 In addition to having difficulty with ADLs, or activities of daily living, older obese adults are more likely than older non-obese adults to have difficulty or be unable to participate in activities such as walking any distance, going shopping, or attending movies, parties, or other social events (see Figure 5). The differences between groups are particularly great for those ages 51 to 69. Work is another activity which appears to be affected. A smaller proportion of obese adults age 51 to 69 are working — 55 percent — compared to 59 percent of non-obese adults of the same age. Of those who are working, obese adults are more likely to have missed work due to their health than non-obese workers. Rates of chronic conditions are higher among obese adults than among their non-obese counterparts, but the differences between groups are particularly great for adults ages 51 to 69 (see Figure 7). Obesity can also affect the severity of chronic conditions. For example, obese older people with arthritis are more likely to say the condition limits their activities than non-obese adults age 51 and older. The number of people who are overweight – those whose body mass index is 25 or above and below 30 – has also increased dramatically in recent years. Nearly 40 percent of Americans age 51 and older are overweight. Like obesity, overweight is consdered a risk factor for many chronic diseases. 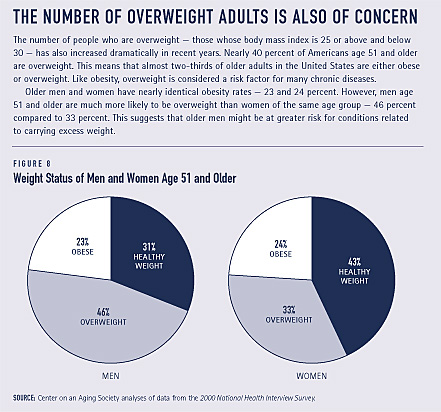 Older men and women have nearly identical obesity rates – 23 and 24 percent. However, men age 51 and older are much more likely to be overweight than women of the same age group – 46 percent compared to 33 percent. This suggests that older men might be at greater risk for conditions related to carrying excess weight. 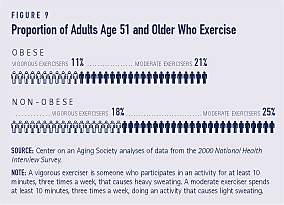 Obese adults age 51 and older are less likely than non-obese older adults to exercise vigorously. They are also less likely to be moderate exercisers (see Figure 9). In the Surgeon General’s 2001 Call to Action to Prevent and Decrease Overweight and Obesity, he stresses that increased physical activity is essential to reducing the prevalence of obesity in this country. 1. U.S. Department of Health and Human Services, Public Health Service, Office of the Surgeon General. (2001). The Surgeon General’s Call to Action to Prevent and Decrease Overweight and Obesity. Washington, DC: US General Printing Office. 2. Kiefer, K. (March 2002). Childhood Obesity: A Lifelong Threat to Health. Washington, DC: Center on an Aging Society. 3. National Institutes of Health, National Heart, Lung, and Blood Institute. (2003). Psychosocial Aspects of Overweight and Obese. Available at: http://www.nhlbi.gov/guidelines/obesity/e_txtbk/ ratnl/22112/htm. 4. Finkelstein, E. A., Fiebelkorn, I. C. & Wang, G. (2003). 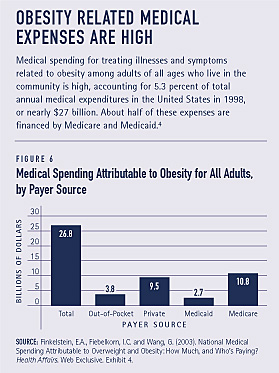 National Medical Spending Attributable to Overweight and Obesity: How Much, And Who’s Paying? Health Affairs. Web Exclusive. 5. Sturm, R. (March/April 2002). The Effects of Obesity, Smoking, and Drinking, on Medical Problems and Costs. Health Affairs 21(2): 245-253. Unless otherwise noted, the data presented in this Profile are from two national surveys of the United States civilian non-institutionalized population. The National Health Interview Survey (NHIS), which is conducted annually by the National Center for Health Statistics, is the principal source of information on the health of the U.S. population. The 2000 Health and Retirement Study (HRS) provides information on the community-dwelling population 51 and older. 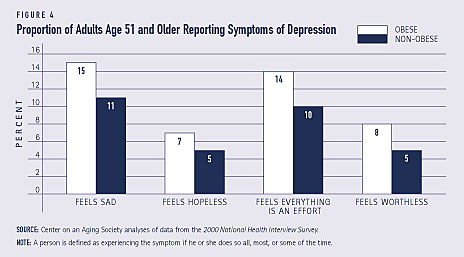 The HRS data set is sponsored by the National Institute on Aging and conducted by the Institute for Social Research at the University of Michigan.